An expert on ancient dynasties, this professor and head of Czech Egyptologists must deal with many problems in the desert, as well as sensitively shuttling among Egyptian authorities and native workers, where a strict hierarchy reigns. Society generally sees scientists as narrowly specialized individuals who are undervalued in practical living. What are Egyptologists like? A good Egyptologist has similar characteristics to those of any good scientist. He must be dedicated to his field and put all he can into it. He also has to have practical living skills as well. He arranges the granting of permits for excavation, and deals with officials and native citizens too. But from my own experiences, I can say that those around us see us as very remarkable people anyway. Egyptology is a way of living that swallows you whole. For example, when I stare off into space for a while when I’m at home, my wife promptly comments, “back in Egypt.” I feel like I’m half Egyptian. Can you describe your organizational structure and job? 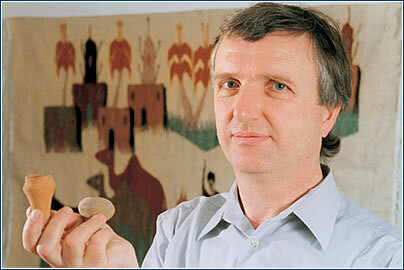 We are formally a single team led by Professor Miroslav Verner, but in our archeological work we are split into several groups. I lead a group that works on large shaft tombs from the middle of the first millennium BC. 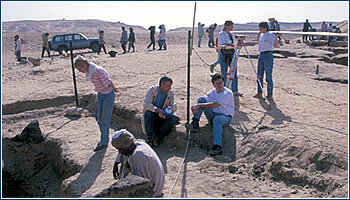 Professor Verner’s group works mainly on royal structures from the fifth dynasty – i.e., from the time of the height of the Abusir burial ground, where we work. And the last group, led by Dr. Vachala, works on private crypts from the end of the third millennium, BC. When Professor Verner is away, either Dr. Vachala or I takes his place. It’s hard to define the ideal leader, because he has to act differently in various, specific, changing situations. Of course in our work this means having sufficient scientific authority, but also being a good negotiator, under Czech and Arabian conditions alike, which means being able to understand and sense a different mentality and social situation. Personal charisma is an advantage, as it means a great deal in the Arab world, and empathy, both in official contacts and with respect to team members. How do you overcome the natural lack of trust of the people on whose sovereign territory you work? It all requires many years of cooperation, but it also depends on our country’s excellent standing in Egypt. Because we were never a colonial power, our position is comparable to theirs. This is especially appreciated by the foremen, who see it as something we have in common. Less prosperous people don’t worry about questions of trust or the lack thereof, they solve more mundane matters, such as what to eat. In that region we function as a source of income, and our foreman must turn away many applicants. But how do you deal with the enormous cultural differences? I’ve been traveling to Egypt since 1974, so I’ve gotten used to it. But our young colleagues always experience culture shock when they first get there. We must primarily adapt to local rhythms that have been established over thousands of years. Friday is a day of rest, and now, according to new regulations, Thursday is as well. If we want to work on a Thursday, we have to officially request a permit. Also, work in the field is subject to the workers’ needs, which means we begin at 7:00 am and finish at 2:00 pm. 1975 Completed studies in Egyptology and Arabic at the Charles University School of Philosophy and began working at the Charles University Egyptology Institute in Prague and Cairo. 1982 Took part in the discovery of papyrus documents of King Neferefre from the middle of the fifth dynasty. 1983 Present at the finding of statue fragments in the complex of King Neferefre. 1996 Took part in the discovery of an unlooted shaft tomb of the dignitary Iuf. 1998 Cooperated in the opening of the sarcophagus of the dignitary Iuf. How does your cooperation work with the locals you hire ? In Egypt there is a foreman system, which is called reis in Arabic, and our expedition always selects them from employees of the Landmarks Council. They oversee the work of laborers and craftsmen who are hired through them. We basically don’t interfere in normal contacts or disputes that may arise among them. We know that it’s not expected of us, and furthermore, it’s the easiest way, because besides the language barrier, a large majority of the workers are illiterate. Do these people see you as an authority they respect? Yes. This is probably because of the traditional arrangement of Egyptian society, which is very hierarchical, in families and at work alike. Our foremen’s family has been working in this field for a hundred years. After forty years of working in Abusir, we became informal members of this family. This is important for our safety, because in Egypt the possession of firearms or blood vendettas between families are still common. How specifically is field work run, and how do you communicate with the foremen? General matters are usually negotiated during visits to the foremen’s homes before the actual field work begins, on various holidays, and after the completion of work. When we work in the field a more detailed specification of tasks and activities for the given day is a part of the morning ritual, which includes greeting the imbibing of the mandatory first glass of tea, which is followed by others during the course of the day. At such meetings we usually adapt to local customs, so both sides can express their opinions on the situation, seeking to find compromises. Do the foremen have work timetables that must be met? What happens if they are not? The timetable is always set by the overall expedition agenda. It is the basis for our agreements with the foremen. Of course we must always count on a certain tolerance, as archeological research brings with it various situations that are hard to predict and cannot be planned for at all. All this generally results in a certain freedom and modifications of set timetables. The foremen handle shortcomings in the laborers’ work, and one result can be dismissal. As for the foremen’s work itself, we usually settle it by reproaching them, occasionally with the participation of other family members or our Egyptian friends. What is the difference between motivating scientists and workers? We are motivated by our hunger for recognition. Our foremen claim that they are motivated by what they see as the honor of continuing a family tradition that has brought great successes. The ordinary workers are motivated most strongly by money. Does your team include any women? Yes. They have it a bit rougher than the men do, because Egypt is a very masculine country. They have to struggle for respect. Our colleague Dr. Květa Smoláriková has already won respect, as our foremen think she’s a better worker than many of the men. This is one of the greatest honors a woman can achieve in Egypt. Egyptology has become feminized to a great degree recently. Two of our student groups are predominantly women.